The author is the Hay & Forage Grower editorial intern and a student at South Dakota State University. The 226-acre farm is a resource for research and outreach under the Dudley Smith Initiative. Dudley Smith was a landowner in the 1800s. After his passing, his son Dudley Smith Jr. took over the crop and livestock operation. Dudley Smith Jr. was concerned about the future of farming and desired to contribute to research that would sustain farmland and rural communities. His concern for the future of agriculture shaped the vision of the initiative. The farm has served as a field-scale research site since 1995. Ballard has been managing the farm since its establishment. In his first 12 years at the farm, Ballard grazed cattle 365 days per year on summer and winter annuals. The trials he composed were duplicated on area farms for 10 years. Ballard spoke in 14 different states on his year-round grazing strategy. He believes that corn and cattle need to supplement each other. 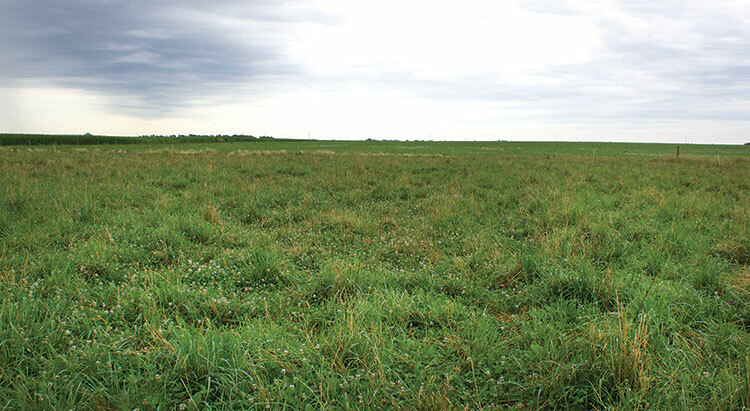 “Our goal is to improve soil and attain year-round forage production,” Ballard said. Teaching over 250 Management Intensive Grazing Schools for Illinois producers, Ballard has extensive knowledge of forage and grazing management. He shares his knowledge with the students that he mentors. Ballard works with eight to 10 University of Illinois graduate students at a time on the farm. Graduate students begin a new agricultural project every four years. He also works with students from grade school to high school on different science and agricultural projects at the farm. Comprised of cropland and pasture paddocks, the farm provides opportunities for a wide range of research projects. There are three row crop plots that are 48 acres each. Two are planted with soybeans, while the other was planted with oats this year. Normally, the cropland is rotated between corn and soybeans. There are also 24 cool-season pastures that average about 2.5 acres each. One-fourth of the pastures were originally big bluestem, but it was found that growing warm-season grasses was costing them 20 cents more per day compared to growing cool-season grasses. As a result, the farm chose to establish three mixtures of cool-season grasses in all paddocks in 2000. The first series of pastures has orchardgrass, red and white clover, and perennial ryegrass. The next series is endophyte-free fescue, orchardgrass, red clover, and white clover. The final series has novel endophyte fescue, red clover, and white clover. They are planning to have all of the pastures reseeded within the next four years. Pastures are kept at about 30 percent clover. “At this level, protein is at least 20 percent and total digestible nutrients (TDN) is in the high 60s to low 70s,” Ballard said. Dry matter consistently averages 5 to 6 tons per year and the forages are tested on a monthly basis. Varying numbers of replacement heifers graze the pastures each year, depending on how many are supplied by area producers. The goal is to maintain high-quality forages for the animal to achieve a higher performance at an economical cost. Grazing days are recorded for each paddock annually. Last year there were 82 heifers, while 70 head are being grazed this year. In the most recent study, heifers were rotated every three days. Animals were split into four groups, and each group was rotated between six pastures. The farm used to have only cow/calf pairs, but replacement heifers have been used the past four years. Between April or May and November, the cattle are kept in summer pastures. Although there is no current research project being done with the pastures, they continue to take monthly forage samples and keep track of the grazing days. A crop science student and an agricultural engineering student are currently starting a drainage nutrient management research project on the cropland. “It will be a four-year project, and then they hope to expand it to look at pasture versus cropland in nutrient management runoff,” Ballard said. There is a diverse combination of soils on the farm with no more than 5 to 10 percent of one type. “This makes it challenging because there are totally different management types with the soils,” Ballard said. Since the farm was established, no commercial fertilizer has been used on the pastures. “We test our theories here, and if they work, we can take them to the university, and there they can be researched on a bigger scale at a larger site,” Ballard explained. Some other projects that have been conducted at the farm include studies of continuous and strip grazing of corn residues, effects of summer supplement feeding frequency, and minimizing fescue toxicosis by grazing novel endophyte-infected tall fescue following grazing endophyte-infected tall fescue. There is an advisory committee for the farm that requests what they would like to see done. The committee is split equally between cattle producers and corn farmers. Ballard says that he “does his best to keep them informed of what is going on at the farm.” He serves as the local contact between the students and the farmers. To further enhance their educational mission, the farm hosts an annual beef cow/calf, nutrient management, water quality, and corn production field day held in early summer. The event includes numerous speakers and tours of the projects taking place. As for the future, Ballard says, “As long as I am healthy and the university will let me, I plan to stay involved with the Dudley Smith Farm.” Ballard’s passion toward farm sustainability and education is undoubtedly strong. This article appeared in the August/September 2016 issue of Hay & Forage Grower on pages 8 and 10.